I remember thinking that that's it when Han and Horner came out. I thought that Blizzard couldn't possibly bring out any more commanders, since they had already done all of the end war characters. Tychus proved me wrong. Now that Blizzard is no longer restrained by the shackles of the cannon anymore, neither are we, meaning we can come up with any crazy concepts we want. For the most part anyways. Sorry Carbot Zergling. My own concept builds on Mr Bunston's, so read it before continuing. Done? Good. First off, let's turn the fanservice up to eleven: Why one cerebrate, if you can have two? The "raider hub" units fit the description of the Tiamat brood in that they are a small but elite force. This force is being lead by no other than our boy Daggy. Since we see Zasz and Daggoth work together in the campaign it should still be mostly lore-accurate and I also think that it captures the idea behind SC1's broods and cerebrates pretty well. Very specialised forces that compliment eachother. Let's continue with a bold statement: Creep spread should not be a thing for this commander at all... At least not in the common sense. Zasz / Daggoth (I will be calling him Z/D from now on) still spreads creep, but only to build more structures. As proposed by Bunston he should use colonies, but not just as a callback. As Z/D's forces are very focused on aggressive tactics, he needs powerful defensive structures to repel incoming attack waves. Aggressive creep spread is something I am against, as the vision role of tumors is being fullfilled by his parasites. I see them as working the same way in the sense that they spread in a similar fashion. You select an enemy unit that is infected and manually spread the parasite from it to the next. While it will still remain on the original unit, it will be unable to infect more units, similar to a used tumor. Since Zasz' forces are "emphasizing ferocity, speed, and surprise" (taken from the SC wiki article on the Garm brood) they always gain the creep speed buff without the need to actually be on creep. I propose a few changes to the unit roster as presented by Bunston. I think basically having the same units in both the raider hub (aka Daggoth) and hatchery (aka Zasz) armies feels a little... repetitive. The distinguishing factor should be speed as opposed to brute force. I am thinking Mutalisks, Scourge, Queens and Defilers (because Queens and Defilers fit his parasite warfare theme) for Zasz; Ultralisks (Torrasque) and Guardians (Kukulza) for Daggoth. Both have Lings (Devouring Ones for D) and Hydras (Hunter Killers for D). I go into more detail regarding my D choices in the next paragraph. A cool idea for Z would be to emphasize the sneaky-aspect of the Zerg race by giving him some burrow upgrades. The roach burrow move and regeneration come to mind, but I also think it would be great to have some sort of aoe stun that charges up when units are underground and triggers when they unburrow to encourage setting traps for your enemy. (Guerrilla warfare.) Other concepts to make his units more unique would be making mutalisk attacks slow (the enemy units movement speed) with a longer range than usual and giving scourge a dive-bomb ability against ground targets that charges up on an area and then deals massive damage. Back to the ambush units themselves! While I like Unclean Ones and I would adore seeing an official Blizzard version of them (in SCII) I am pretty sure that they don't fit the theme of the ambush. You call in brute-like front line units, not spellcasters that require additional micro. No Kukulza Mutalisks either. Although I would argue Kukulza Guardians would fit in very well. The units you deploy when "ambushing" should focus on head-on engagements, the normal ones on harassment and mobility. One key difference between Z and D is the earlier mentioned speed boost. It would apply to Daggoth in the opposite way. His units never get it, even when they are on creep. Why these changes? It's pretty much like Bunston said. The ambush cooldown might be pretty short, but you should still have to think strategically about when to use it, to use it efficiently. The cooldown is short, but the units also only remain deployed for a short time and they are slow. Ouff! That was a lot of text to read through (and gosh did it take long to write!). Thanks for sticking around till the end! If you want to read even more I suggest you check out the wiki articles on the Garm and Tiamat broods. You can call me Knall. Well there is a template map for custom commanders so there is nothing stopping you from implementing your idea. The idea behind this thread was to take the concept further. I thought people could share their thoughts on Z/D. Northing is set in stone (obviously, I mean I edited my first post like, ten times :) ) and creating an in-game version this early on would probably limit everyones ability to interpret this concept/add to it. I also have 5 commander concepts in the works. Btw. what do you think of Bunston's concept? I could if you want. Sounds like a good concept except the lack of creep part since celebrates always are associated with creep. The gaining the creep movement boost when off creep would have to be a high level perk. Hmm. I guess I thought that the creep part didn't quite fit with the operations on hostile territory thing. It especially didn't fit in with "guerrilla tactics", since the Garm brood is all about being sneaky and giving your position away is not helpful with that. Although a cool way to incorporate creep would be to make enemy structures spawn creep upon death. That would allow the player to set up fortifications on hostile territory, something that wouldn't be possible with creep colonies. An alternative would be to make nydus exits generate creep. I think I like this one better because it would empower the player to easily fortify his means of reinforcement. Maybe give them the creep launcher unit to allow them to quickly make paths of creep? I dunno. Wib, I guess. I think making these kinds of decisions is hard, as it is difficult to estimate what would actually be viable for the player, without extensive testing. That's at least why I personally favour passives over units when it comes to defining a commanders playstyle. They don't force you to tech into a specific direction in order to interact with what makes a commander unique. Edit: Before I forget; I would love to read about (or maybe even play with) your commanders. I am always curious about what other people can come up with. Most commanders are meant to have multiple builds which are viable but on the hardest difficulty there is usually only one strategy that most people go. It will be a long time before I am finished making them. Use a command post as an equivalent to the TC and Hellstorm missile turrets for aa. Has a unique economy in that civilians (0 pop) spawned from the TC and supply structures (cap per structure) fill up the economy and unit production structures to increase their operating efficiency to 100% with a level 4 perk to increase efficiency to 125% with more civilians. There is a heroic structure (like Swann's drill) that can be upgraded to give a global aura with the effect depending on if the economy (faster harvesting), offence (attack speed) or defence (armour) morph option is chosen with 3 tiers of each monument (level 7 and 14 perks). There is a level 9 tech cache perk unlocked at level 9 which gives the monuments a static weaker secondary aura effect of build speed, damage and life regen respectively. One of the two calldowns is also determined by the path chosen with offence giving a large area aoe stun that deals minor damage, defence giving life/energy pickup drops to an area and economy hiring some random mercenaries that drop pod in to the location. The second calldown summons a Gorgon battlecruiser that slowly moves from one side of the map to the other along a straight line set by the player and only starts cooling down once it is defeated or reaches the end of the map (max 1 at once). Unit wise there are Dominion Marines which are lower life but slightly cheaper marines, Warhounds as the medium ground and Wodens (between the Thor and Odin in power but costing more than the Thor and limited in the number able to be owned at once with a level 11 perk to increase the number). Support units are the Spectre and APC (acts as a slow mobile bunker). For air units there are the Valkyrie (similar to SC1 version) and Pride of Augustgrad battlecruisers. As a unique unit/structure there is the Artillery Cannon which has global range but requires the target to be visible and has a random inaccuracy on the impact location but does heavy splash damage to a moderate area. There is also a Dominion Officer hero unit with a low revive time that acts as a support for the armies with an anti armored grenade ability, the ability to draft civilians in an area into some free marines and an Effect-Instant to boost the max life and range of nearby units for a short duration. Has Consciousness Simulator as the TC (nothing special other than visual) and Automaton modified worker units which has a ranged attack it can use while moving and can build other automatons. Has 3 calldowns with Smoke Screen which applies a Fog Generator debuff to an area for a 0 sec duration, Sentience Penetration which restores 150 energy to units in a small area and Strike Squad which summons 4 light ground units that start with an energy penalty. Unit wise for light ground the Vermin is a modified version of the Combat Drone which costs less and is faster but has lower life and range. For the medium ground there is the Walker which is similar to a goliath in that it has aoe anti air and an ability to stun ground units and deal minor damage. For the heavy ground there is the Replicator which is a modified and overpowered Crusher with reduced resource leech and an ability to create another copy of itself on killing enough mechanical units. Under support is the Demolition Droid which can burry to create a mine field around it, damage and disable channelled structures and do an aoe stun+damage after a prepare time. The Engineering Mechanism which is able to cloak and construct temporary support structures which can heal, give radar intel or deal weak long range splash damage with a large bonus to structures and minor bonus to massive. For air there is the Barrager which launches a cloud of aerial mines which deal splash damage on contact and drift outwards from the caster and drops a secondary splash blast to ground units under the mine when it contacts an enemy or reaches the end of the drift radius. With the heavy air is the Flying Fortress which can deal short range heavy damage against ground and able to morph to a ground form where it can deal splash damage against air and has life regen when out of combat in ground form. Perks mostly focus on improving the defensive structures and reviving units/units used to merge larger units. Also based on the community project custom race idea with a Server Core as the TC. Basic merge material production structures gain an extra production slot (like reactor) and augmentation item units no longer have requirements. Calldowns are Auxiliary Support to summon a random augmentation item unit, Viral Hack which disables enemy structures for 15 seconds and chains to nearby structures and Nanite Swarm which does healing over time in a medium area. Unit wise it has the Combat Drone as a light ground which is able to fire while moving and climb cliffs but has lower range and life than a marine. The Flexible Loadout Unit and its upgrade unit the Defcon are in the medium ground position having less life but 2 more inventory slots than the Standard Combat Unit while the Defcon has reduced max shield and shield regen compared to the Clanker but can morph into a stationary form to project a +5 max +1 regen shield (stacking up to 3 times) to nearby units. The heavy ground unit is the Mark V which is a modified version of the Dreadnaught which loses the long range main frontal cannon for enhanced side turrets and requires individual upgrading to be able to hit air. The Blaster is the first support unit that does a constant stream of low splash damage with a bonus vs shields and energy burn equal to the damage. The second support unit is the Mender which is a flying medic able to heal up to 4 units at once of fewer targets for more that does bonus healing to mechanical and can heal while moving. For the light air there is the Sky Sweeper which is only able to hit air with a low range high attack speed weapon and has an ability to tether itself to the target slowing its escape. As the heavy Air unit is the Fortification Buster which has a slow turning arc and does high damage single target damage with a strafe weapon that has a long period. 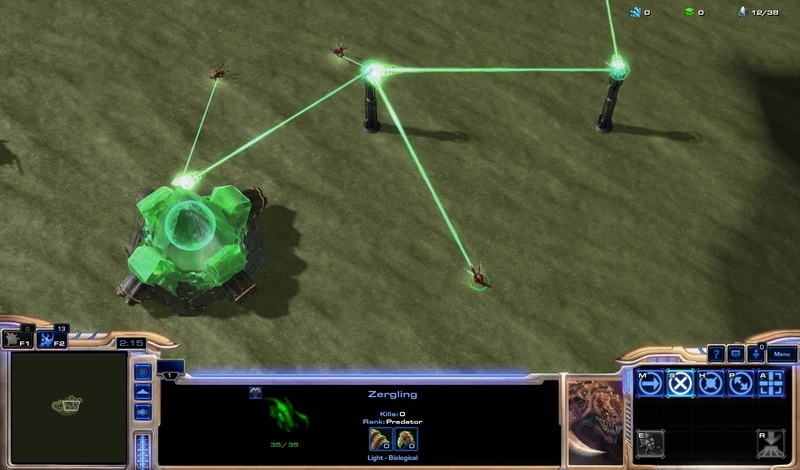 As a unique unit there is the Threat Assessment System which has the Iterative Combat AI passive which causes enemies nearby to take additional damage based on the number that has already been killed near one of these units (stacking up to a cap), a passive aura that increases friendly units damage against biological units by +2 and a Target Critical Systems ability which deals 20 damage, reduces armour to 0 and reduces attack and movement speed by 10% for 7 seconds. Perks focus mainly on boosting units using the item units used to customise army stats. I will add the other two later. That sounds like you have some really creative ideas. I am looking forward to hearing more! Also based on the community project custom race idea with a Shard Of The Consciousness as the TC. Killed enemy structures and heroes drop fragments of the consciousness that when picked up give a bonus to the augmentation item units. Calldowns are Auxillary Conduit which summons a free power network node and Matrix Overcharge which gives 25% temporary damage reduction to all friendly units in a power field for 30 seconds. Unit wise for light ground there is the Soldier Unit which is a more expensive but durable Combat Drone and has an autocast augment ability that does additional 30 damage in exchange for large amounts of energy. As medium ground there is the SCU which can specialize against an attribute and its upgrade the Clanker which rapidly regenerates its low max cap shield when out of combat. For the heavy ground there is the Dreadnaught which is a slow moving/rotating unit with a high energy drain outside a power field that has a 11 range primary weapons that can shoot in a small arc while moving but has a minimum ground range of 3 and air range of 7 while it has two weak splash side anti ground turrets for stuff under 3 range and can only have one weapon system active at a time. Support 1 is the Thermal Loader which is a modification of the Petard which can spawn stronger but slower to produce versions of the Blasting Charge suicide unit that has more damage and splash radius but can also damage friendlies. Support 2 is the Blitzer which is a modification of the Hauler which is the transport unit losing the ability to move but gaining a global teleport that needs energy and a prepare time dealing moderate splash damage on arrival. For the light air there is the Strategic Bomber which launch multiple splash munitions at air and ground targets which can jump to nearby units to maximise splash. For the heavy air there is the Ironclad which is a more armoured but more energy inefficient modification of the Flying Fortress. As a unique unit there is the Anti-Ballistics System which is a mobile anti missile unit similar to a terran point defence drone but with slower period but sustained defence. Perks mostly focus on conduit zone control with buffs and debuffs in their area of effect and energy management for units. Custom race themed on parasitic zerg with Brooding Chamber as the TC/basic troop production structure which attracts some mineral critters. Workers are replaced with Slaver Brood structures that periodically spawn wandering but uncontrollable Slaver Drones which zombify critters and weakened enemy units to return them to a dropoff to be converted into resouces. Minerals are used to build supply structures with 2 tiers and Vespene geysers are used to build Pheromone Stalks which "attract" additional critters for the slaver drones to harvest. The anti ground defence structure is the Pit Tunnels which slow enemy movement in their zone of control and randomly root enemies dealing minor damage. Having a ground unit stationed inside the structure adds the damage of the unit as a dot for the duration of the root. The anti air structure is the Scourgeling Roost which deals weak splash damage to air units with a chance to disable the weapons for a duration. Unit wise the light ground is the Dinergate which is a slower but tankier Zergling that acts as the builder and has an ability to disable the target movement and the caster attack for a duration to stop ground units fleeing. The medium ground unit is the Dorciferon which is a ranged attacker able to launch nearby slaver drones at a weakened target and acts as a mobile unit training structure and dropoff. For the heavy ground there is the Sporant which is slow and low health compared to other T3 ground units but is able to mind control a single enemy unit within a leash range leeching life from it while being able to control the target unit. As Supporter 1 there is the Usurper which can herd Slaver Drones towards a target area, temporarily blind a group of enemies and lay eggs into a target unit slowing it and dealing minor dps but if the target unit dies as a result of the buff some timed life units are spawned with their number based on the phase of the ability. Support 2 is the Phoront which can attach itself to a friendly unitor structure giving it a minor life, armour and life regen stat boost and two tentacle turrets to attack nearby enemies and the caster unit is left unharmed on host death but the ability is put into cooldown, Burrow and move slowly when burrowed and parasitize neemy structures slowing progress abilities by a stacking percent up until a cap where a stukov like spawning structure is created on the enemy st5ructure disabling it until the spawner is destroyed. As the light air there is the Scavenger which is a melee air unit able to hit both ground and air and has an ability to stun targets for a few seconds and has a passive to leave killed units as a paralysed corpse for slaver drones to collect. For the Heavy Air there is the Raider which acts as a carrier except the spawns and the caster both attack and the spawns carry killed units back to a dropoff and the caster acts as a more efficient reusable slaver drone. Perks are evenly spread for all unit but have several for increasing salvage from parasitism. When I think of a new race I start with a template of roles and a theme when I am inspired and then I try to think of 4 campaign variations for each unit. Also the robot race is not remotely terran. Several cerebrates are named in the lore. Daggoth, Nargil, Gorn, Zasz, Araq, Kagg, Auza and Zargil. There were apparently countless others in the background that were not mentioned. Didn't want to offend you. :-) I just compared to what I already know and the robots seemed more like Terran than the other races. You're right! Their broods all have specific traits that would make them unique when implemented in coop but I choose Z and D because they are arguably the most iconic. They are the only cerebrate characters to ever appear before Blizzard shafted the zerg and turned them into Kerry’s and Amon’s slaves. Yep. Not a fan of the "they all died" thing either. I like the idea of SCII queens and broodmothers but they resulted in the Zerg loosing a lot of their personality. I generally disliked the direction that the games took in general. I mean, back in 1998 the official website (an earlier iteration) and the manual suggested that the three-way conflict would last indefinitely in Koprulu (and the zerg's invasion of the protoss empire would be a galactic apocalypse, since back then the Protoss were a galactic power and the Overmind was the ultimate villain). The game just bulldozed through all those interesting plot hooks and ended up really shooting itself in the foot by killing all the governments. The Confederacy, Conclave and Overmind could have kept the franchise running indefinitely without ever leaving Koprulu, but now the setting is much smaller, bland and boring.